There is an undisputable fact that Americans love their Vets. We at Wounded Heroes of America rely heavily on the help and support from our community to be able to accomplish the work we do. Without the help from community leaders, business owners, and local politicians we could not do what we do. We have developed the best relationship, friendship, adoption; call it what you will- but it’s a collaboration to help our wounded Veterans with the South Bay Sunrise Rotary Club of Torrance. This club is not the biggest club around, they meet at 7:00am (which is not Happy Hour) yet they are the biggest givers, most motivated, happiest people you can meet at 7:00am in the morning. Best of all, they are one of our biggest supporters and best friends. We have been beneficiaries in so many ways. Wounded Heroes of America is, and has been, one of their chosen charities to contribute to. Here is a picture showing Mike Talleda, President of WHOA, receiving $5,000.00 from the proceeds of the ‘Ride with the Tide Bike Tour’. Over 600 riders took part in this event with proceeds going to local charities, WHOA being one of them. This group has been amazing. 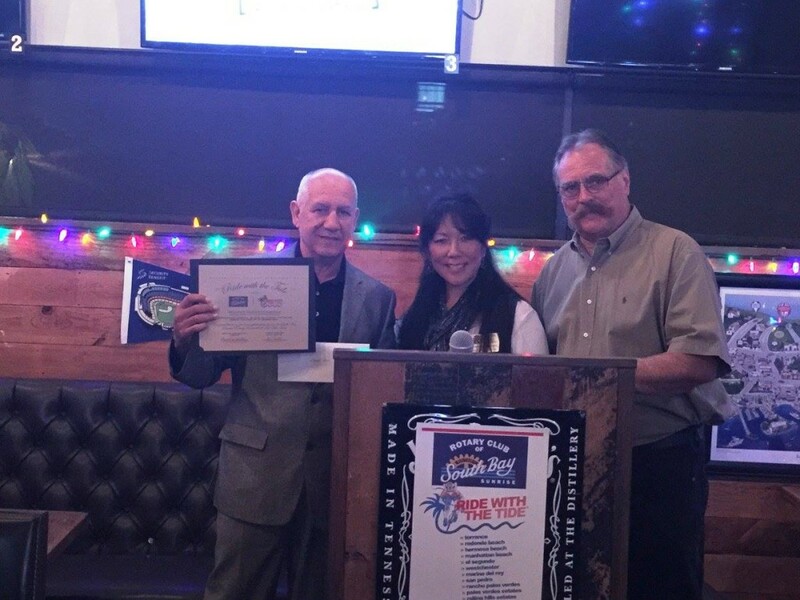 Our foundation has received so much support from the South Bay Sunrise Rotary Club of Torrance. In addition to the bike ride, WHOA has also been beneficiaries of their Wine Tasting event, the 2014 previous bike tour ride, they have adopted families for Christmas, their members have donated cars to our Vets and they still find time and resources to help all sort of different charities and a slew of causes, both national and international. When we say that the community has an obligation and the resources to help our combat wounded Veterans, this club is the prime example of what is possible. Thank you South Bay Sunrise Rotarians.